The Dow Jones today traded over 100 points lower in pre-market trading as investors eyed this week's meeting of the Federal Reserve Open Market Committee. The U.S. Federal Reserve is expected to announce this year's first interest rate increase during the meeting – a move that is likely to increase market volatility. Markets are taking a wait-and-see approach to this week's Fed meeting. This will be the first meeting led by Fed Chair Jerome Powell, who replaced Janet Yellen earlier this year. Powell will give his first press conference Wednesday. 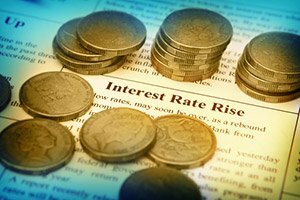 Investors anticipate that the central bank will hike its benchmark interest rate by 0.25%. Ahead of tomorrow's meeting, the two-year Treasury yield hit its highest level since 2008. Markets anticipate the central bank will hike rates at least four times in 2018. Gold prices are ticking lower on concerns about rising interest rates. However, geopolitical events continue to provide support to the precious metal. Front and center, The Washington Post reported Sunday that U.S. President Donald Trump has elected to remove national security advisor H.R. McMaster from his administration. The report comes just days after Trump fired his Secretary of State, Rex Tillerson, over Twitter and replaced him with CIA Director Mike Pompeo. Trump recently announced that both Canada and Mexico will be exempt from tariffs on steel and aluminum. The question is now whether other nations around the globe will retaliate with tariffs on U.S. goods. The European Union is considering tariffs on U.S. corn exports, although American shipments of corn are just a small percentage of total exports around the globe. Many agricultural analysts are expecting that China will soon restrict access to its market for U.S. soybeans. The price of Bitcoin fell to as low as $7,400 over the weekend as markets continue to digest regulatory efforts by governments around the globe. The downturn came despite increased optimism that the Trump administration will reduce capital gains taxes in a second round of fiscal policy reform. Over the weekend, Bitcoin slumped after Twitter Inc. (NYSE: TWTR) announced plans to ban cryptocurrency adds. The social media giant joins rivals Facebook Inc. (Nasdaq: FB) and Alphabet Inc. (Nasdaq: GOOGL) in the ban. Crude oil prices slipped thanks to profit-taking from Friday's surprise gains. On Friday, oil prices hit their highest level since March 7 on concerns about rising tension in the Middle East. During an interview with "60 Minutes" that aired on Sunday night, Saudi Arabia's Crown Prince, Mohammed Bin Salman, announced that his nation would pursue its own nuclear weapons program should Iran develop its own nuclear bomb. The interview was published on Thursday. Today, the WTI crude oil price today fell 0.6%. Brent crude dropped 0.5%. Oracle Corp. (Nasdaq: ORCL) leads a light day of earnings reports. The tech giant will report earnings after the bell Monday. Wall Street expects that the firm will report earnings per share (EPS) of $0.72 on top of $9.785 billion in revenue. Shares of Facebook Inc. (Nasdaq: FB) are off 3% this morning due to the fallout from a scandal relating to a company tied to the campaign of President Trump. Cambridge Analytica allegedly mined more than 50 million users from Facebook's data trove without the firm's permission, a claim that the social media giant has denied. A whistleblower revealed the plot to The New York Times and The Observer, a British-based newspaper. Stocks have very heavy valuations these days – which is why I want to show you an easy way to make money in one of the most underrated methods in the markets. Today, I want to show you how activist investors can make you rich by buying heavily discounted closed-end funds. This is a very profitable low-risk investment strategy that anyone can do, and it takes just a minute to learn. To get started, learn about the Aberdeen Japan Equity Fund Inc. (NYSE: JEQ) right here. Look for earnings reports from Canadian Solar Inc. (Nasdaq: CSIQ), HealthEquity Inc. (NYSE: HQY), and Mediwound Ltd. (Nasdaq: MDWD). Atlanta Fed Bank President Raphael Bostic Speaks at 9 a.m.